Periodontal probes are the instruments designed for specific purpose of assessing the periodontal health with clinical techniques. Periodontal probes are used to measure, locate and mark the pockets and also determine their related to each tooth surface. Probe is a tapered, rod like instrument calibrated in millimeters with a tip, in case of periodontal probe the tip measures 0.5mm. The probe is made up of 3 parts Handle, Shank and Working end. When the probe is inserted into the pocket for examination a firm and gentle pressure to the bottom of the pocket is applied. The shank should be aligned parallel to the long axis of the tooth being examined. 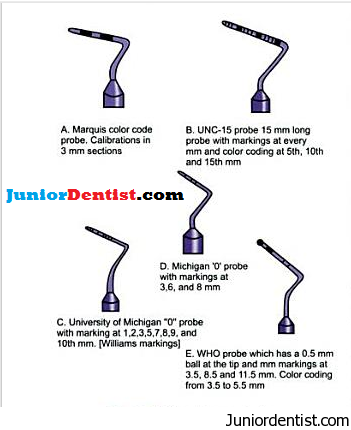 University of Michigan ‘o’ probe: Periodontal instrument with markings – 1,2,3,5,7,8,9,10 mm. markings 4 and 6 are missing in the probe the reason for this is explained below. WHO probe (CPITN Probe): The tip of the probe has a 0.5 mm ball at the tip and millimeter markings at 3.5, 8.5 and 11.5 mm and the color codings are 3.5 to 5.5 mm. Williams Probe: It is also called the periodontal probe it is the first probe to be used to assess probing depth of a pocket, it has the following markings – 1,2,3,5,7,8,9,10 mm. 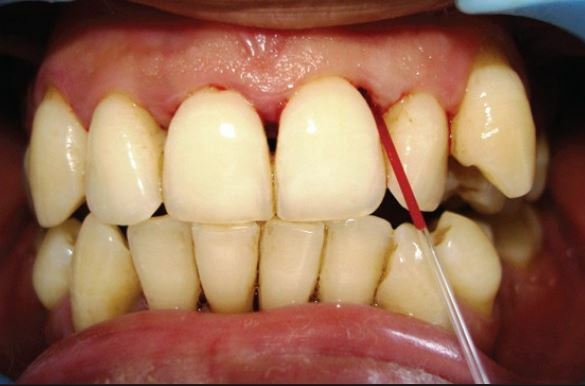 “Why are 4 and 6 markings missing is a periodontal probe ?” – In this probe the markings 4 and 6 are missing to decrease confusion in determining the depth of the Pocket. This missing numbers makes it easy for determining the depth of the pocket due to the small size of the markings. And as 5mm pocket depth is considered to the optimum pocket depth which can be managed. Very helpful. You may consider updating with pictures and other recent probes. Visuals is always key in learning. Sure, will try to update with the same. Can you please point out the ones which I might have missed so I can update them in the post. Thanks this post. The 5mm statement of “this is the pocket depth that can be managed” was very interesting.